This weekend, from Friday, February 1 to Sunday, February 3, features a massive SoCal Museum Free-For-All, the L.A. Cookie Con, a Night of Ideas at NHM, Photo LA and MUCH more. PLUS: Be sure to scroll down to see our picks for where to watch the Rams play on Super Bowl Sunday. 1.Photo LA comes to the Barker Hanger in Santa Monica from January 31 to February 3 celebrating photography and how it fits within the realm of fine art. 3. Severance Wine Bar wants to celebrate your single status during their BREAKUP BAR POPUP. Taking place next door to the bar, the two week long party will transport guest into an anti-Valentine’s Day world with break up appropriate movie screenings, a Wall of Broken Relationships, loads of champagne, cocktails and food. 4. 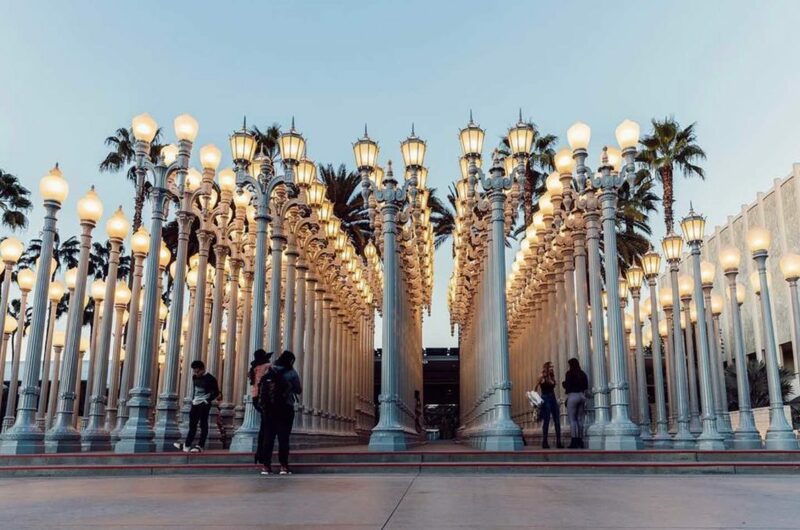 Never been to LACMA? First-time Fridays is a new monthly event for new visitors to the museum. Simply let the ticket office know you’re a newbie and you’ll receive a free poster, discounts and a welcome gift. Stop by after 3 pm with a L.A. County residents ID and get free admission. 6. Dine on specially priced lunch and dinner menus at one of SGV’s best dining destinations through Taste of Alhambra Restaurant happening January 27 through February 2. 7. Rare Books L.A. comes to the Pasadena Convention Center February 1 – 2 to help book lovers discover literary treasures from all over the world. The fair will feature one hundred of the finest specialists in antiquarian books, fine prints, photography, and ephemera from throughout the United States, Europe, and Asia. 9. Dreamscape Immersive, the latest contender in location-based virtual reality, has opened in the Westfield Century City mall with three unique adventures that include an alien zoo, a deep ocean dive and an action packed adventure to find a powerful jewel. Open seven days a week. 10. It’s First Fridays at The Village in Redondo Beach. Merchants and art galleries will stay open till 8 p.m. and a live performance by Mr. Loop next to the Aloha Bungalow. 11. Greenbar Distillery will open up their facility for a tour of their organic distillery. The tour allows guests to learn about the process of spirit making and taste some of Greenbar Distillery’s portfolio. Happening every Friday through Sunday of this month. 13. Since its the first Friday of the month check out all the cool events happening around town including block parties and art walks for First Fridays. 14. Free admission at: Norton Simon Museum (5 to 8 p.m.) and Long Beach Museum of Art. 16.Smorgasburg Dumpling Day at Santa Anita Park will introduce the most interesting new dumplings in So Cal, from the likes of Workaholic, Brothecary and other popup dumpling vendors. 18. Japanese Food and Culture Association presents the 2019 Japanese Food Expo a day of tastings, entertainment, and workshops. 19. Spend a night at San Junipero, LA’s first retrowave club night. Dance the night away to 80s-influenced retrowave/synthwave music and take in vibes all inspired by the popular Black Mirror episode. 21. Celebrate the Year of the Pig at Universal Studios Hollywood starting this Saturday with some of your favorite characters. Check out Po’s Village and savor Asian delights at Mr. Ping’s Noodle Shop. Meet Illumination’s Minions in traditional Chinese attire and a Mandarin-speaking Megatron from TRANSFORMERS. The Lunar New Year pop-up will run till February 18. 22. The Petersen Automotive Museum will host a free screening of The Incredibles 2. 24. Angelenos can karaoke their hearts out in the comfort of their very own Sanrio-themed rooms that include private spaces dedicated to Gudetama, Aggretsuko, and Hello Kitty at Energy Karaoke located in Alhambra. 25. Old Pasadena Historical District offers a walking tour every first Saturday of the month. 26. The Pickwick Vintage Show comes to Burbank this Sunday featuring over 65 exhibitors from across Southern California with one-of-a-kind vintage clothing, jewelry, and accessories, textiles and more. 29. LA’s adorable cat cafe Crumbs & Whiskers will host yoga this Sunday. Please bring your own mat and water for this one hour session. 30. Spend an evening learning All About Valentina at the Luckman Fine Arts Complex at Cal State LA. The LA-born Mexican-American drag star is best know for RuPaul’s Drag Race and the role of Angel in Fox’s production of RENT Live! 33. Vegan Sunday is a weekly 100% vegan market place featuring local food, apparel, cosmetics, and lifestyle vendors. 34. Challenge yourself with a 75-minute yoga class while enjoying views of the DTLA skyline during Flow + Flavor: Rooftop Yoga at Smorgasburg x ROW DTLA. Looking for a place to eat, drink and watch the Super Bowl this Sunday? Check out our list of the best spots do just that below! Oh, and go Rams! Watch the Rams take on the New England Patriots 73 floors high at Spire 73 located inside the InterContinental Los Angeles Downtown. Starting at 1:30 p.m. guests can dine on ‘L.A. Rams’ Chips & Salsa, ‘L.A. Rams’ green chili pork sliders, and an L.A. torta burger. For Tom Brady fans, there’s some Patriot options too. Entry cost $25 a person, which includes a three beer bucket and after party with a live DJ. Prank bar will open at 11 a.m. to screen the big game on a massive seven-foot projector. Fans can score big on deals with $3 to $5 cocktails during commercial breaks, chosen by Prank’s Wheel of Fun. They will also host group party games and Chef Ricardo’s Front Porch BBQ (starting at 3 p.m). Boomtown Brewery will have the game on a projection screen in their taproom with the sound on. Almost all their beers will be discounted and they’ll feature different food vendors all day long including Republic Craft BBQ and S’moreology. Casita del Campo will screen the game on a large projector next to the bar with surround sound while guests enjoy Mexican cuisine, handcrafted margaritas and ice-cold beer. Hotel Shangri-La will host a poolside feast with a big screen TV with the game on. The entrance fee is $55 a person and includes a BBQ combo platter (Shangri-La burger, chicken wings, herbed fries and two beers). You can keep the beer flowing with a bucket of four assorted beers for $20. Baltaire just rolled out a new happy hour menu and will offer game day bites, steaks and burgers, $5 beer specials, and $10 cocktails. The game will be shown in the lounge on big screen TVs, and prizes will be given at the door. Brack Shop Tavern will sell tables for the big game. Prices range from $75 to $150 for 2-7 guests. A wing and pitcher package will be included with each table purchase. Groups of 2-4 will receive 30 wings and a pitcher of Heineken, and groups of 5-7 will receive 60 wings and two pitchers. Baldoria will host a Super Bowl bingo party with drinks and pizza as prizes. Happy hour is all night, as well with $3 beers and $7 Old Fashioneds. They will also offer $2 shots every time either team scores a field goal, touchdown, or safety. Toca Madera will serve brunch from 11 a.m. to 4 p.m. and their weekend happy hour from 3 – 6 p.m. while the game is on. Corner Cantina, Spring St. Bar and Beelman’s will be showing the game with sound on! Wallis Annenberg PetSpace is hosting Super Pup Sunday. Both the football game and Puppy Bowl will be streamed in the Wag 1 viewing room on different screens while complimentary food and refreshments will be provided. Dogs are welcome, just be sure to read the rules regarding visiting pets.